Since the days of the Green Shed Studios and the big Farfisa organ we had there, I’ve always had a bit of a soft spot for the sound of the organ. Nothing else sounds like a proper pipe organ being played well in a cathedral and echoing round the space, filling the audio spectrum with trouser-flapping bass and angelic overtones. And the latest addition to my sonic arsenal fits the bill – it sounds nothing like that, but perhaps a bit more like an asthmatic monk playing an accordion in a public toilet. 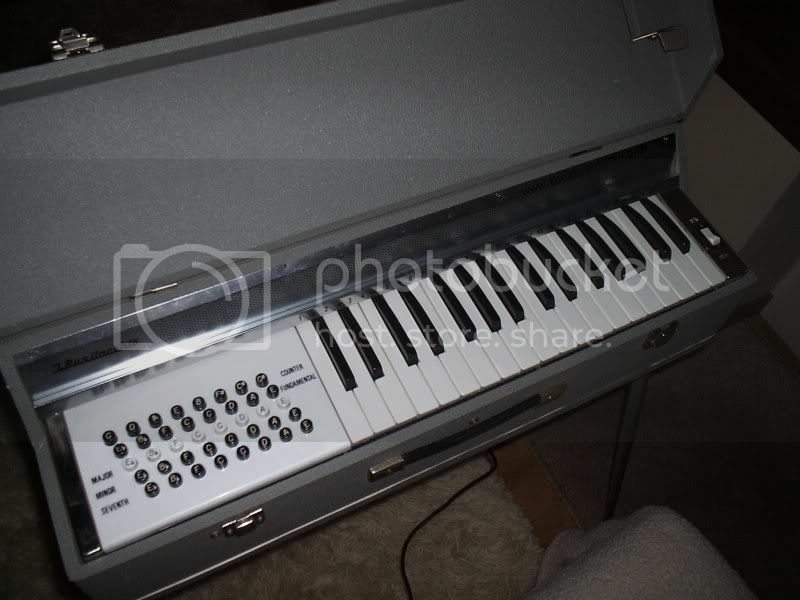 Introducing the J. Busilacchio electric reed organ – it’s a keyboard in a suitcase, includes 4 legs which screw in to the bottom and an on/off switch. Turn it on and a fan starts pumping a cool breeze across your fingers and you’re ready to go. It has a great sound – effectively it’s a harmonium without the bellows, or a horizonal accordion. The air gets pumped over metal reeds which results in a rich sound a bit like a pipe organ with a bad cold – not as bold or clear, but with a dignified, if slightly dishevelled, air. It’s defintely more Ivor Cutler than Van der Graaf Generator, but that’s certainly no bad thing. It sits quite well with theremin, so I may create something to feature the two together. There’s really not a lot of information available about these – they do crop up fairly regularly in online auctions, along with similar items by other manufacturers. I’ve seen them described as dating from the 40’s, which I find a little hard to believe, as they have more of a 60’s feel to them. They’re also known as Chord Organs, due to the panel of accordion-like chord buttons to the left of the keyboard, though this tends to lump them in with some pretty ugly-looking plastic things with plastic reeds which really are not in the same league. If anyone has more information about the history of these critters, let me know. I’ve done some more digging around, and discovered various different versions of the organ. I’ve put details on a new page on the Deserters site, here. Note to eBay sellers: You are welcome to use the details about Busilacchio/Lorenzo organs from this page on the condition that you include a link to this page (http://www.the-deserters.co.uk/inst_organs.html) on your listing so that your potential buyers have access to all the information.